As a pretty big fan of the Fullmetal Alchemist anime series, the news of a live-action movie had me cautiously optimistic. I had rather enjoyed the Samurai X live-action movies as they were a nice balance of honoring the manga or the anime that inspired it while also making the most of the movie medium. So that gave me more hope than had some American production company tried to do this - remember the horrors of the American Death Note? Fullmetal Alchemist as a movie mostly based on the manga series of the same name. As the movie's story spans several issues of the original comic, it contains a condensed amalgamation of multiple stories brought together into a more or less coherent narrative. There's a lot to love about this movie but there were a lot of opportunities as well, so it's hard to say how things really went down here. They covered a lot of ground but maybe the should have left room for other stories or something. Or future movies even? 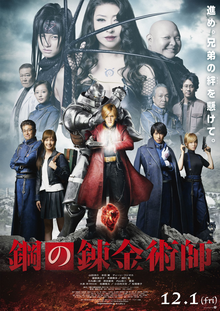 Synopsis: Fullmetal Alchemist is a fantasy movie written and directed by Fumihiko Sori. The screenplay was co-written by Takeshi Miyamoto as based on the manga of the same name by Hiromu Arakawa. The story revolves around Edward Elric (Ryosuke Yamada), also known as the Fullmetal Alchemist, and his brother Alphonse (Atomu Mizuishi). It is revealed that the brothers had once attempted human transmutation in order to bring their mother back from the dead. But instead a monstrosity was created and Alphonse lost his body while Edward lost his leg as the laws of alchemy asserted themselves and demanded a harsh price. Edward was able to bond his brother's soul to a suit of armor but his original body remains lost. We follow the brothers as they try to track down reports of Philosopher's Stones being used. They hope to acquire a stone for themselves in order to use its power to restore their bodies to normal. But along the way they end up facing a whol host of odd cases of alchemy being misused. The fact that there seem to be so many of these Philosopher's Stones about speaks of a greater mystery. What I Liked: The movie takes serious steps to pay homage to the manga that inspired it. And thus you get some cartoon-style physics from the very start of the movie and a lot of characters styled to look just like in the anime and such. I super love Alphone's armor suit, which has some serious weight to it despite it being a CGI construct. It's just real enough for one to suspend judgement about because it works so well. The casting of Ryûta Satô as Maes Hughes as brilliant as he nicely embodied the character, particularly his anime version. The special effects for depicting a lot of the alchemy in the movie was pretty great and enjoyed how things played out. The opening sequence made for a great action piece to kick things off and we had a lot of good demonstrations of different styles of alchemy at work. What Could Have Been Better: I was disappointed by Ryosuke Yamada as Edward Elric. Beyond appearance, he just didn't quite bring the character to life as much as I wanted and it didn't carry well. The same goes for Yasuko Matsuyuki as Lust as her performance felt a little one-dimensional and not at all like the complex villain she was in other versions of this story. And the storty as a whole was rather confusing in certain parts. I understood things more because I had watched the anime series, and thus I was familar with the stories referenced here. However whrt was included in the movie didn't quite deliver the same emotional impact of the manga or the anime series as things didn't quite get to build up as much as I would have liked. This is particularly true when it comes to the Tucker family as the reason why it is such an internet meme is that we spent a few episodes watching the brothers bond with Nina before...well you know what I'm talking about. TL;DR: Fullmetal Alchemist wasn't a terrible movie but it was the odd result of a longer story compressed into a tighter arc that tried to make sense within 135 minutes. It gets a lot of things right but it also misses other things, leaving us with a story that was weaker than what had come before it. Thus the movie gets 3 strange alchemical creations out of a possible 5.